I’m fortunate not to have any dietary restrictions beyond my unfortunate inability to consume my own body weight in bacon and red wine. I do, however, have a number of friends who’ve committed to gluten-free eating for a variety of reasons ranging from celiac disease to gluten-intolerance to “gluten just makes me feel icky.” The unexpected bonus for me is that I’ve become quite familiar with Bend restaurants doing an outstanding job on the gluten-free front. Here are seven dishes and eateries you simply MUST try, whether you’re a gluten-free diner or just a foodie looking for a great meal. 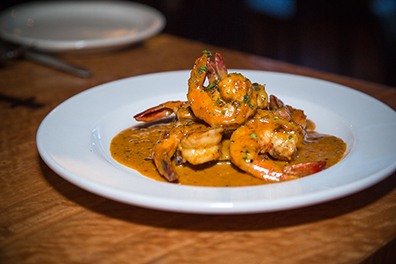 Even if you’re not a gluten-free eater, the barbecue shrimp at Zydeco are ah-may-zing! 1) The barbecue shrimp at Zydeco. This has been one of my favorite dishes in Bend for years, and it wasn’t until two days ago I had any idea it was gluten-free. The spicy, creamy sauce they use on these shrimp is so magical, they actually sell it in containers to take home. If you’re lucky enough to eat it at the restaurant, you can choose between having it served over grit cakes or mashed potatoes. Both options are delicious, and if you’re not restricted to gluten-free dining, ask for extra bread to mop up the sauce (gluten-free diners can request gluten-free cornbread). Besides the shrimp, Zydeco has an impressive menu packed with gluten-free appetizers, main courses, sides, and desserts, so this is one of your best bets in town if you’re committed to omitting the gluten. 2) Grab a sandwich at La Magie Bakery and Café. One of the most common complaints I hear from gluten-free pals is that gluten-free bread often tastes like dusty shoe leather. That’s fortunately not the case at La Magie, which boasts some of the best baked goodies in town, including divinely delicious (not to mention non-leathery) gluten-free breads. Most of the sandwiches and burgers are available on this bread, so you can pick among tasty options like an avocado club, mushroom swiss burger, Venetian chicken, and much more. 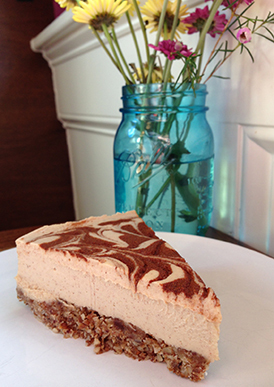 This raw, gluten-free, almost-vegan (minus the honey) cheesecake at Salud! will leave you swooning. 3) The to-die-for-desserts at Salud! Raw Food. When a friend suggested I try dessert at this place, I was skeptical. I’m not much of a dessert fan as it is, and the idea of eating one that was raw, gluten-free, and mostly vegan (minus the honey) it sounded as appealing as snacking on a piece of cardboard. Talk about eating my words! I ordered a slice of their spiced apple cinnamon cheesecake claiming “I’ll just try a bite.” I was so smitten after one taste that I had to fight the urge to throat-punch my friend so I could eat the whole thing. The crust is a delicious blend of cinnamon, almonds, and dates, while the cheesecake is a mix of coconut oil, cashews, nutmeg, cinnamon, cardamom, raw honey, apple juice, and lemon with a little swirl of maple syrup and cinnamon on top. It was deliciously moist and flavorful, and I would go so far as to say this is one of the best desserts I’ve had in Bend PERIOD—never mind the gluten-free label. Salud! circulates new desserts regularly, so check back often to see what they have. 4) Pizza at Local Slice. Plenty of Bend pizzerias have hopped on the gluten-free bandwagon and started offering options for gluten-free diners. One of the tastiest in town is Local Slice, which makes their dough from Bob’s Red Mill Gluten Free Pizza Mix. Their toppings and cheese are locally-sourced, and they offer an interesting array of options like the Fire on the Mountain (spicy red chili, roasted peppers, red onions, fennel sausage, mozzarella & tomato pomodoro). Bonus: If pizza isn’t your thing, grab a gluten-free calzone made from the same dough! 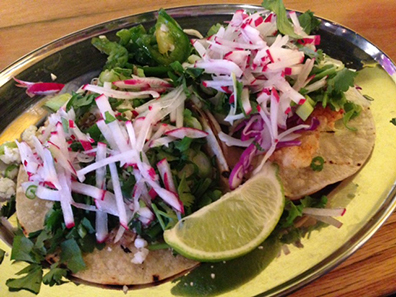 Tacos at Spork = so good! 5) Tasty tacos at Spork. Some of you might know Spork from its days as a cute little street cart, and others might know it from this amazing write up in the New York Times. What’s most important to know is that most things on the Spork menu are naturally gluten-free and absolutely delicious. One gluten-free pal speaks highly of their fried chicken, but I’m fiercely loyal to their tacos. It’s a tossup for me between the pork carnitas tacos (cotija, radish, green onion, cilantro, fried garlic salsa verde, and jalapeño pickles) or the fried catfish tacos (chili mayo, salsa verde, cabbage, radish, jalapeño, green onion, and cilantro) so I usually just order one of each for $3 apiece. They can also do vegan or dairy-free versions if that’s what rolls your socks up. 6) Sticky chicken at Real Food Street Bistro. I’m obsessed with the soups and sandwiches from this awesome little food cart at The Lot, but I just learned they also offer a unique array of gluten-free entrees. One that caught my eye (not to mention my palate) is the sticky chicken. It’s a lightly fried chicken breast in sweet chili sesame sauce served with your choice of kimchee salad or carrot-cucumber-ginger salad for $9. The specials and soup selections here change regularly, so keep an eye on their Facebook page for regular updates. 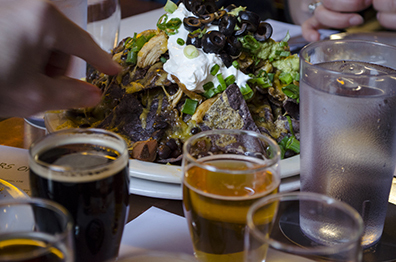 Grab a gluten-free beer and a plate of nachos at Broken Top Bottle Shop. 7) Nachos at Broken Top Bottle Shop. Like Zydeco, this is another Bend restaurant that’s really got it dialed-in on the gluten-free scene. There are tons of gluten-free options on the menu at BTBS, ranging from salads to entrees to desserts, but one of my favorite treats is the gluten-free nachos. They feature corn tortilla chips topped with gluten-free, vegetarian chili, cheddar cheese, green onions, black olives, O’Hana salsa, sour cream, and edamame guacamole. Yum! It’s $6 for a small, $10 for a large, and an extra $4 to add roasted chicken or pulled pork. There’s always at least one cider on their tap menu and several gluten-free beers in the bottle cooler, so the gluten-free folks have something sudsy to sip. Previous article: Who’s ready to go sledding in Bend, Oregon? !